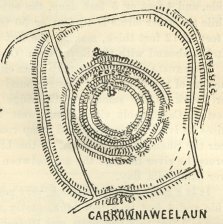 Carrownaweelaun.—In this townland, in a boggy field, is a fine fort greatly overgrown. It has a second circle, now much defaced, but traceable, and 5 feet high. The central fort has a garth, 75 feet across, with a ring 18 feet thick, 8 feet to 10 feet high over the fosse, and 5 feet or 6 feet over the garth. The fosse is wet, 21 feet to 23 feet wide, and 4 feet or 5 feet deep, the outer ring, 8 feet to 12 feet thick, while the outer circle is 40 feet or 50 feet across at various places, and 8 feet to 12 feet thick, making the fort about 268 feet over all. The ditches abound with the Royal Fern (Osmunda).